Off we go onto another board! 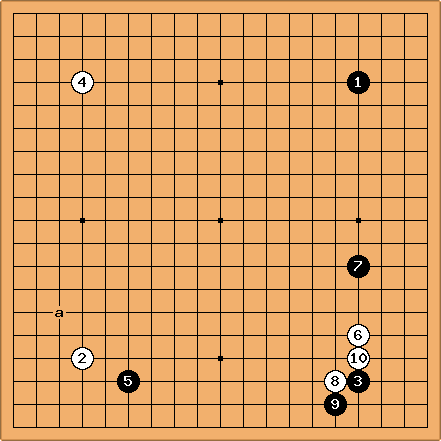 TnG: OK, I guess that's why 10 should be one point to the left; now the hane looks no good for White. Sigh... : I feel like I need to stabilize a bit, and also put pressure on the corner. Wish I knew how to do both at once. : I waffled for a minute before picking a combination pincer and extension (more below). : Black 13 looks good. Waffling between a, an attachment somewhere next to 13 (b), or playing between the square-marked and 13 (c). At a is no good -- threatens an extension to the left or capturing a stone with d. So Black will gladly take a big point on the bottom (short-circuiting White's extension), and if White d, Black e is sente and the corner is safe, while White will still need to cover f. So I will play 14 as an extension from 12 and simultaneously a pincer against the circle-marked Black (I hope!). The b points seem to lead nowhere because of the square-marked black stone. The c points look good if I can get sente. : I've always liked the hoshi; though lately I've been playing a 3-4 point (probably because of looking at Shusaku games). Diagonal from Black 1 -- because I vaguely recall reading somewhere on SL that maybe the diagonal fuseki favors Black; therefore, White might as well prevent it. Besides, I don't want Black to get the diagonal corners followed by tengen. : I'm tempted to play a kakari in the lower right, but the empty upper left just seems more prudent. Hoshi seems to give Black fewer targets. : Hmmm! I always get lost in the fuseki. I considered 6 at a, but then Black at 6 or one point to the right would be too ideal for Black. : Moves like Black 7 make me wish I knew some josekis. With 8 I hope to contain White in the corner, and build strength to attack Black 5; alternatively, I hope to get a large lower-right corner. If I somehow also keep 3 separated from 7, I will be happy. : Hmm, maybe this should be one point to the left. I really ought to study some joseki!